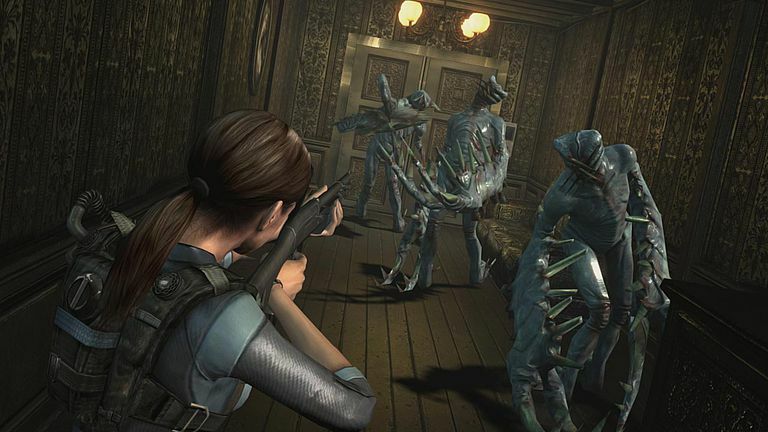 This article gives away many plot points of Resident Evil: Revelations and should not be read by anyone who hasn't experienced or given up on the story. The monumental failings of the story in Revelations are particularly surprising for two reasons. One is that Resident Evil games usually have fairly involving stories with intriguing characters and occasional moments of genuine emotion. You don’t always understand the full narrative, which can be very convoluted, but from moment to moment the games are fairly comprehensible and absorbing. The second surprise is that Revelations was written by successful anime/manga writer Dai Satō. He wrote on great anime series like Samurai Champloo. He’s also written a few other games. And yet, Revelations is just awful. Why? Here are six reasons. Warning, there are spoilers aplenty here. Revelations seems as though it was written by someone who made a list of every phrase in every action movie, ranked them according to how often they were used, and then worked in all the top phrases. “Your destiny is in my hands.” “I have my reasons.” “You’re our only hope.” You could build a drinking game around the game’s use of stock phrases. Good twists involve misdirection that leads to the inversion of assumptions. The bad guy turns out to be the good guy. The dead girl turns out to be alive. The sister turns out to be the mother. The planet turns out to be future Earth. In Revelations, you see everything coming. In an episode titled Revelations, O’Brien finally explains how he and Raymond faked the resurgence of Veltro to trick Morgan. But by then, the game had made it very clear that this was exactly what was going on. Call an episode “Revelations” and we want to be told something surprising; We don’t just want all our suspicions confirmed. No one could be surprised by this point unless they were expecting the twists to make logical sense. The game’s shifts in place and time tend to be abrupt and poorly set up. Jill and Parker arrive on a ship to search for Chris and Jessica. Then we get a news report. This is followed by Jill and Parker on what appears to be the day before they arrive on the ship, although the game doesn’t bother explaining that. Then we’re in the mountains with Chris and Jessica; surprising unless you caught a quick allusion to those mountains. Then back to Jill and Parker and then a year back with Parker and Jessica and Raymond right before Teragrigia is destroyed. And so on. Some might argue that this is the game’s attempt to create a sense of mystery and disorientation, but there’s a difference between mysterious and unclear. Some of the characters in the game seem very stupid, yet the game doesn’t portray them that way. O’Brien’s plan to draw Morgan out by faking a resurgence of Veltro is about as crazy a scheme as any created for I Love Lucy. Parker’s preventing Raymond from keeping Jessica from blowing up the ship is incomprehensible, considering he had just pointed a gun at her, she’d just tried to push a mysterious button with no explanation, and she had shot Raymond then offered an unpersuasive explanation. This sort of thing gives you little confidence in the writer’s vision, so in the end when we discover that Raymond and Jessica have actually been working together all this time, it’s hard to accept that this is a well thought-out twist. It means that Jessica’s faux-killing of Raymond and Raymond’s attempt to stop Jessica from destroying the ship were both part of some elaborate plan, and that while Jessica was presumably working for Morgan and Raymond for O’Brien, they were actually probably working for neither, a can of worms that will probably be opened, and botched, in the inevitable sequel. There have been some really appealing characters in the RE games, but here, characters tend to be either dull or irritating. Jessica’s flirtatious banter feels forced and makes her annoying, although part of that may just be her somewhat irritating voice. Even worse are Quint and Keith, two whiny tech nerds who fulfill the role, familiar in many movies, of bad “comic relief.” Raymond is also very unlikeable, although I think he’s supposed to be, which would make him one of the game’s few successful characters. As for series regulars Jill and Chris, they are just painfully dull and stodgy. They don’t have one personality to share amongst the both of them. The movie apparently hopes that whatever fondness you've developed for them from earlier games will carry over to this one. Shortly after being shot and presumably killed, Raymond walks into a room, indicating that he was wearing a bulletproof vest. That’s perfectly reasonable, although it doesn’t explain why he pretended to die to begin with. But it’s also the last time the game bothers to explain how a character survived. When Parker drops about 30 feet into a raging inferno, he is discovered later no more injured than before the fall. We see Quint and Keith in the bright light of an explosion, then switch to an exterior shot of the area being carpet bombed, yet the two are seen walking away through the mountains at the end. Does one movie really need, or deserve, four fake deaths?